For the past one and a half years, I have been documenting every single vintage Rolex Daytona that came along the way. In addition, many high level collectors have entrusted me with the sensitive information about their beloved watches. Thousands of vintage Daytona case numbers and half a terabyte of data came together. 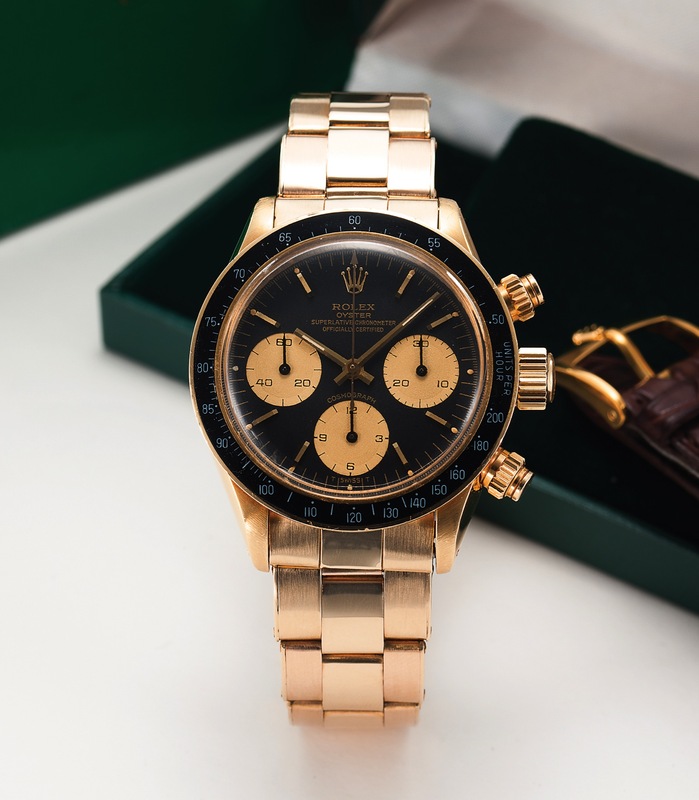 As a result, I was able to create the largest and most advanced independent vintage Rolex Daytona database in the world. 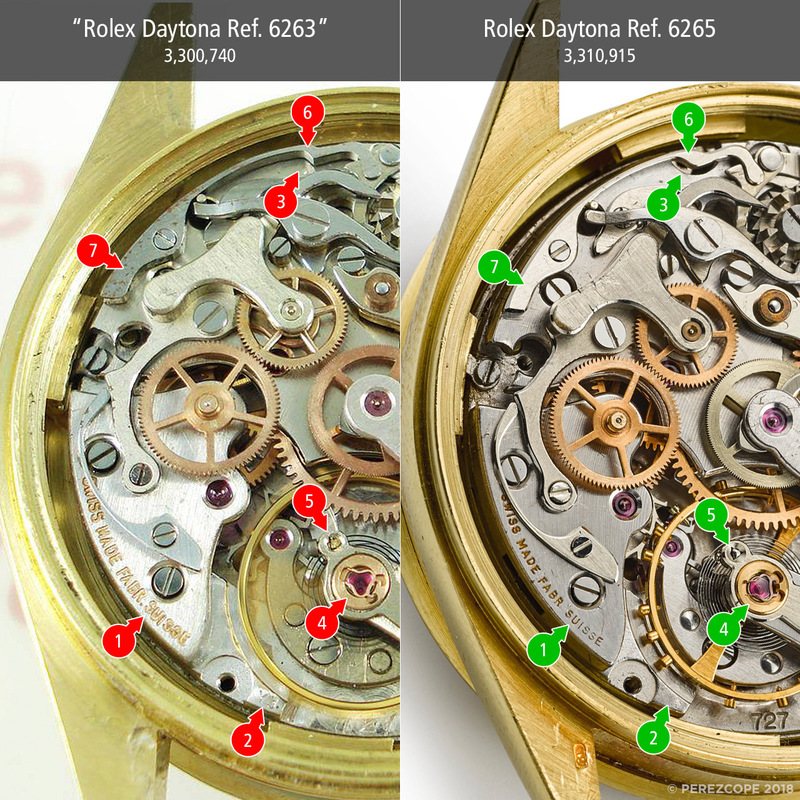 Every stain, every scratch, even the smallest details are documented, thus making it super easy to search for particular watches or simply compare certain watches with each other. The other day, while surfing the web to gather further data for my database, I came across Vintage Watches International, a vintage watch shop that is owned by a German guy residing in Switzerland. The official address of the shop is located in Gersau on the shores of Lake Lucerne in Switzerland. 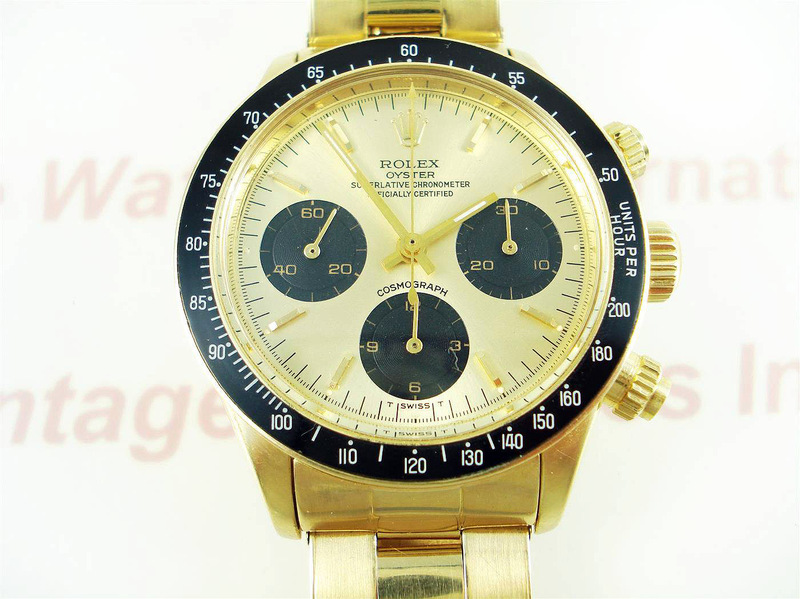 The shop appeared to be legit at first glance but after browsing through the different listings, I discovered a Rolex Daytona 6263 YG (Yellow Gold) with a 100% fake and converted standard Valjoux 72/726. A closer inspection revealed that the whole watch is most certainly fake. The shop owner claims on his website to have years of experience in vintage Rolex. At least since 1999. Then how is it possible that a watch with such a badly converted movement did not ring all alarm bells? Update October 7, 2018: The seller withdrew the watch as soon as the news broke. He stated that the watch was in consignment. Since the owner of the watch is a good client, the seller said he had no doubts about the watch. The watch in question is a Ref. 6263 Daytona in yellow gold which features a Rolex Oyster dial with “Superlative Chronometer Officially Certified” inscription. This implies that the movement passed rigorous tests to deserve this important denomination. 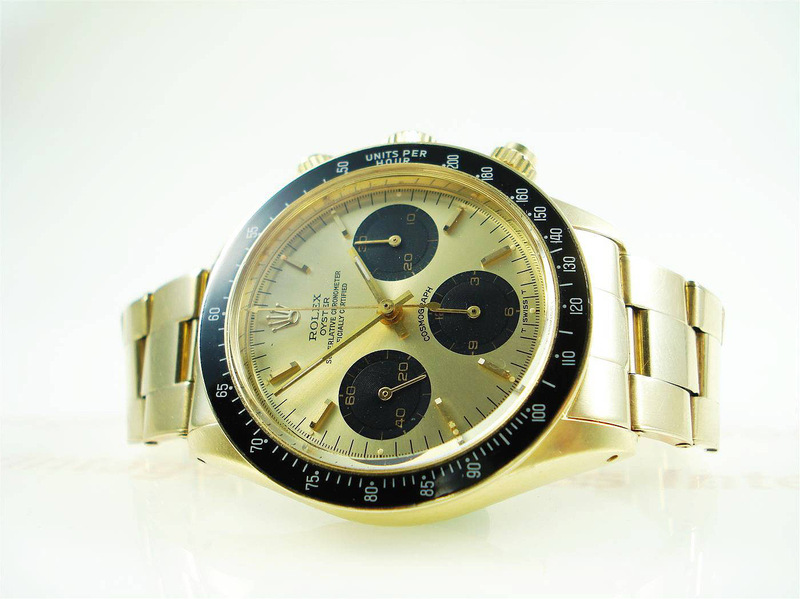 Only gold Daytonas of Ref. 6263 and 6265 were given the privilege to feature the “Superlative Chronometer Officially Certified” denomination on their dials. These watches came originally with chronometer papers titled “Attestation de Chronomètre Officiel”. A glance at the accompanying papers of the watch in question is enough to understand that there is something funny going on. The papers that come with the watch are non-chronometer papers and definitely not from a COSC certified vintage Rolex Daytona. A closer look at the movement reveals more inconsistencies. The movement installed in this watch is a made up Valjoux 72/726 which was modified to look like an original Rolex 727 caliber. It certainly never passed the rigorous tests of COSC (Contrôle Officiel Suisse des Chronomètres). To put it plainly, this movement is fake and was not made, neither by, nor for Rolex. 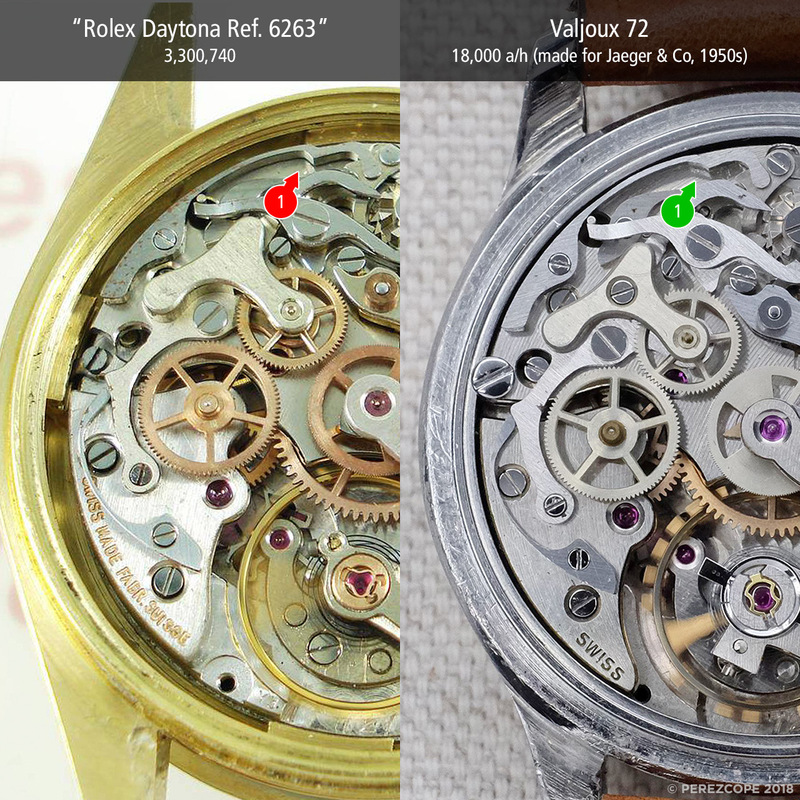 Let’s compare the movement in question to a proper Rolex 727 from a 6265 that is only 10,000 case numbers away. The first thing that catches the eye are the obviously fake engravings on the train gear bridge (1). Another detail that does not add up is the “Y3” stamp on the main plate (2). So far, I have yet see another vintage Rolex Daytona movement with this kind of stamp. There is also a missing hole in the barrel bridge (3). Only early Valjoux 72s did not have this hole (alternative casing screw). It can therefore be assumed that this particular barrel bridge came from such an early movement. The retaining ring for the KIF shock protection spring does not have the pronounced inner bevel (4) as seen on original movements. Also, the area where the Breguet overcoil hairspring is connected to the regulator (5) has an unusual and imprecise shape. 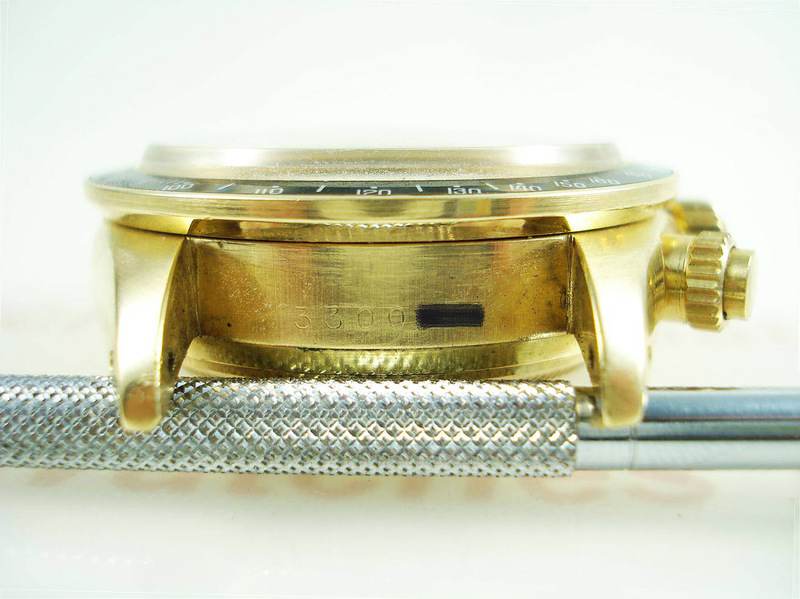 The operating lever spring (6) has a wrong shape and absolutely no bevelling (7), as opposed to original Rolex 727s. The next comparison shows very clearly that the so-called chronograph bridge (Y-shaped) has most certainly been altered (1). Have a look at the inner bevels (2). The jewels appear to be sitting lower on the original Rolex 727. The reason for this is pretty simple. 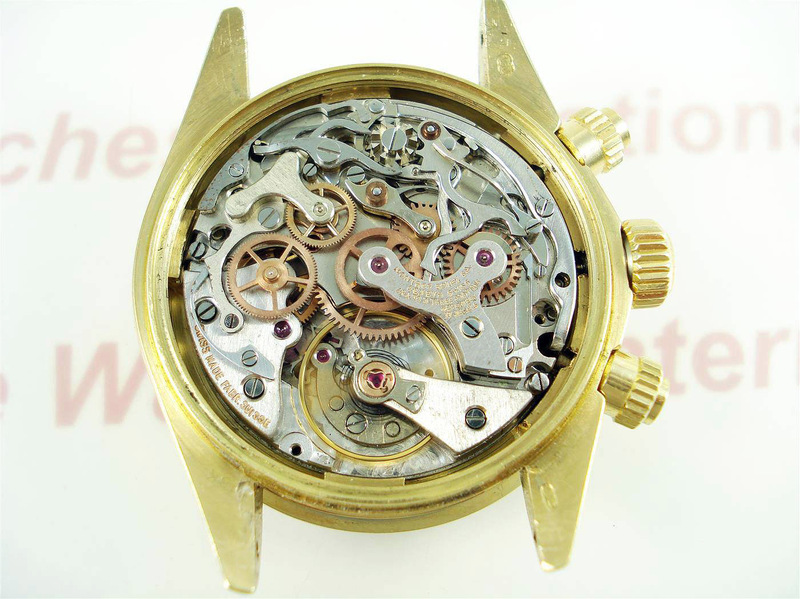 The chronograph bridge on the movement in question was probably shaved down to remove the original engravings from another brand. Another important detail is the minute recording jumper (3). The difference is quite obvious. 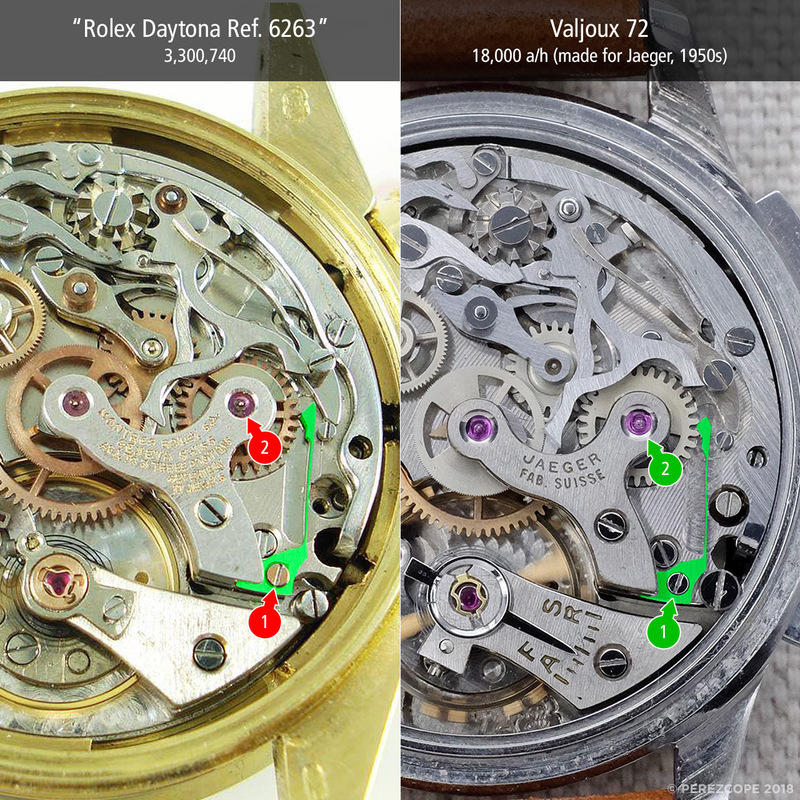 The reason for this is that the jumper on the movement in question is an non-adjustable part from an older Valjoux 72. All vintage Daytona movements, be it caliber 72B, 722, 722-1 or 727, came with an adjustable minute recording jumper (two screws). The overall finish of this movement is very poor and absolutely not comparable to the finish of original Rolex movements. A closer look at the operating lever (4) shows that the bevelled edges (anglage) are inconsistent. The same applies to the hammer (5). The bevelling is badly executed. Just look at the perfectly executed bevelling on a proper Rolex movement. The question was raised, as to why the hammer (5) is in a different position on the proper movement. This is a movable part and appears to be engaged with the column wheel in this particular picture. The following video demomstrates how the various levers are moved by the chronograph pushers. This exposé would not be complete without finding the movement parts that were used to assemble, respectively convert this movement to make it look like a Rolex movement. The following comparison shows were non-adjustable minute recording jumpers (1) can be found, on a standard Valjoux 72 from the 1950s. Have also a look at the levers. None have bevelled edges (anglage finish). 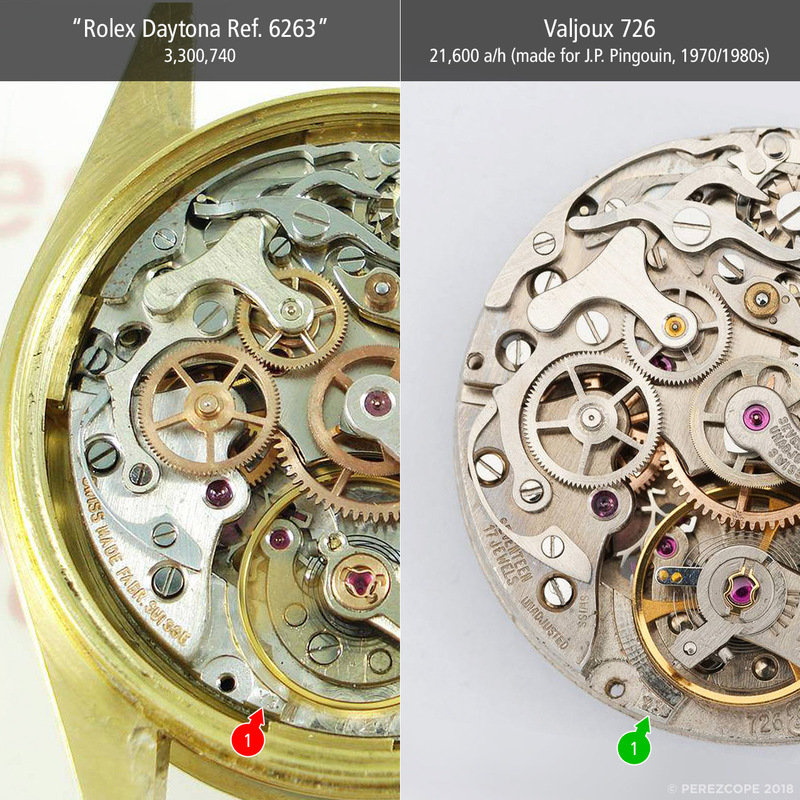 This comparison also shows that the chronograph bridge on the movement in question was most certainly shaved down in order to remove the original engravings from another brand. The jewels are sitting considerably lower (2) on the Jaeger movement. The next pictures show where the main plate with the distinctive “Y3” stamp (1) probably came from. At at certain point in the late 1970s/early 1980s, Swiss movement makers like ETA, Unitas, Valjoux and others started to mark their movements with “Y3”. It is unknown what “Y3” stands for (possibly an export mark?). The very same “Y3” stamp can also be found on Valjoux caliber 730, which is the 21,600 a/h version with calendar. 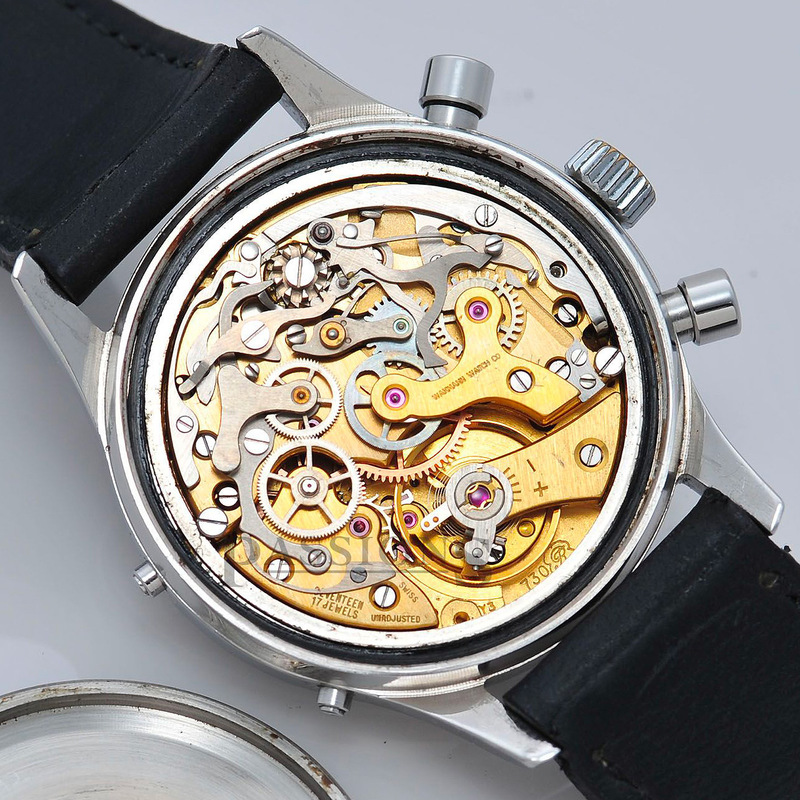 As mentioned before, the barrel bridge without the alternative casing hole (1) can be found on older 1950s movements. After evaluating the evidence, I believe that the movement in question was assembled by using parts from different time periods. The main plate with the distinctive “Y3” stamp came probably from a late 1970s/early 1980s Valjoux 726 or 730. The barrel plate came from a 1950s Valjoux 72. The chronograph bridge (Y-shaped) was most certainly shaved down to remove the original engravings. It was later reengraved with fake Rolex markings. Such a fake or converted movement compromises the whole watch. The rest is immediately suspect, especially if, like in this case, the papers are proven to be fake. One look at the caseback is enough to understand that this type of markings were only adopted in the 5 million case number range. The hallmarks on the case are not correct either. The case number between the lugs is most certainly fake. Interestingly, a watch with the same case number was auctioned by Antiquorum in February 2014. More on this later. 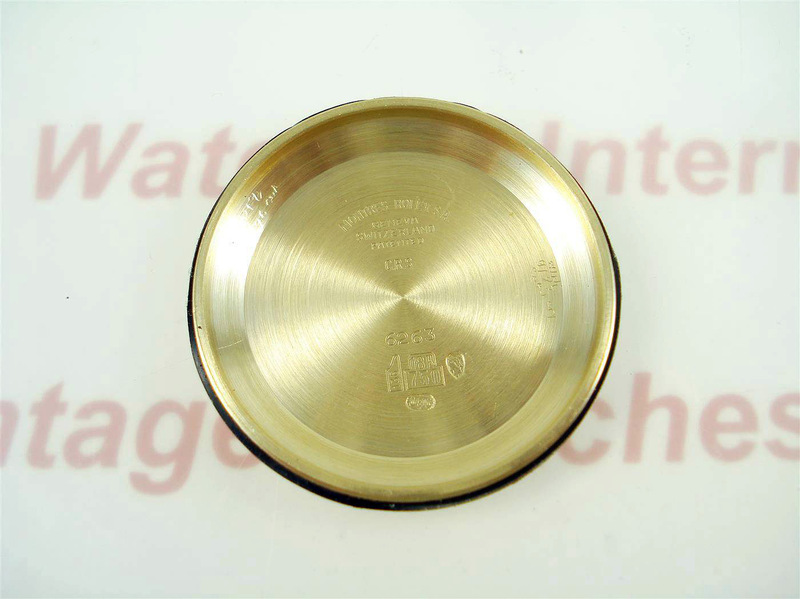 It is said that these high quality gold fakes originate from Germany. It is interesting to note that a watch with the very same case number 3300740 was auctioned by Antiquorum in February 2014. 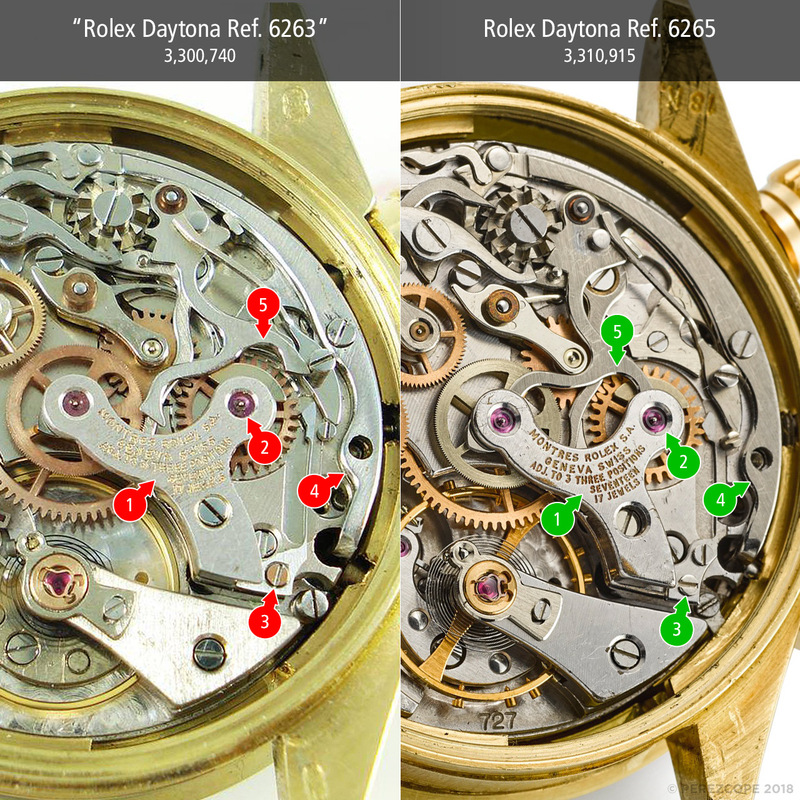 This example shows how good Rolex counterfeits have gotten. 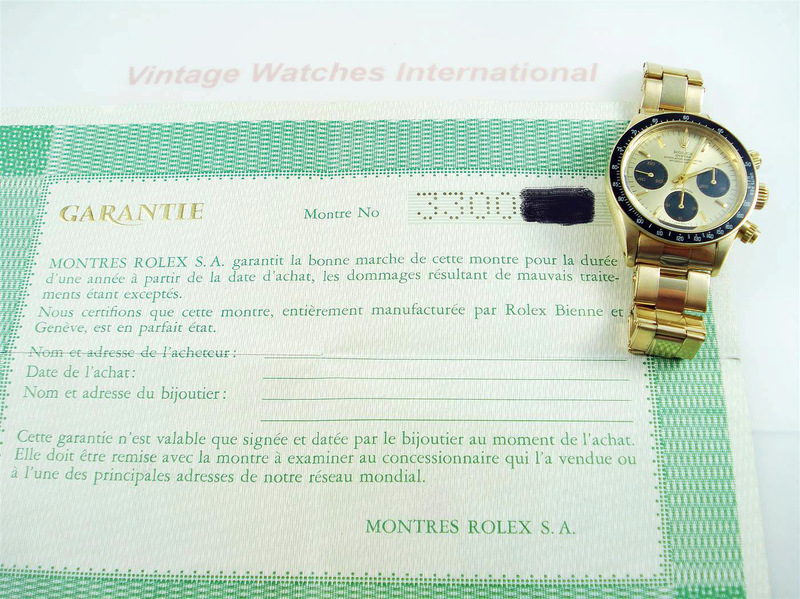 An experienced vintage Rolex dealer should nevertheless be able to spot a fake like this. I double checked this watch with a few vintage watch experts and all answered it is fake. I am therefore extremely surprised that the owner of Vintage Watches International, a guy who claims to be experienced in vintage Rolex, listed this watch as if there is nothing wrong with it. Thank you for your interest. Make sure you follow me on Instagram. This is how the so-called “Luminor” was born, as a Radiomir… NOS 6152/1, property of Maria Teresa Panerai. My heartiest congratulations on exposing this fake. Too bad we have unscrupulous low life individuals perpetrating fraud on ethical collectors. The hair-coil itself seems to have a lot less coils (shorter), probably affecting performance and should be a clear indication of a fake… First notion that I made comparing images (I could be totally wrong here, Not being a Rolex-expert of any sorts).